Not as much fun as a barrel of monkeys. As children, we were fond of throwing controllers whenever a video game (Marble Madness, for example) pissed us off. This was a great way to relieve stress, since NES pads are durable and can withstand a pounding. 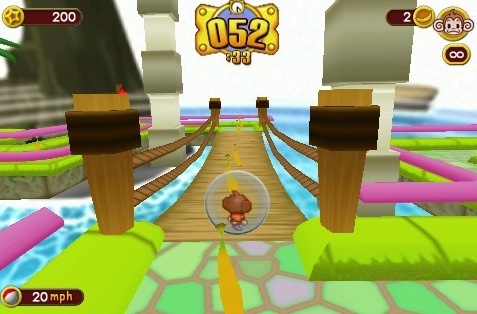 Sega's Super Monkey Ball, however, makes us want to break our iPhones. 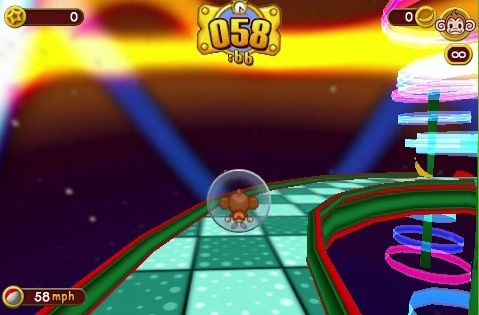 Like previous games in the series, Super Monkey Ball challenges you to guide one of four monkeys (encased in a transparent ball) to the goal by manipulating the game board, tilting it in a series of directions and narrowly avoiding death and other pitfalls. It's cute, looks great stretched across the iPhone's glorious screen and runs smoothly. Presentation wise, this is the best game for Apple's platform. However, it isn't much fun to play, no thanks to a steep learning curve that makes learning the mechanics immensely frustrating. Instead of controlling the boards using an analog stick (like in the original GameCube release), you physically manipulate the iPhone, maneuvering it in a series of directions. On paper, this is a phenomenal idea, since the iPhone has an accelerometer that seems perfectly suited for plenty of Monkey Ball shenanigans. In practice, it's much too sensitive, as our poor monkeys plummet to their doom with just the slightest motion. In fact, we were stuck on one of the opening boards (on Easy, no less) for a good 25 minutes, a stage that we could easily clear had we used a GameCube controller. Rolling forwards and backwards isn't as much a problem as moving left and right. It's difficult judging the sensitivity of our turns, and this is especially problematic when we need to adjust the camera. Attempting to get the best view often sends our monkey balls spiraling out of control, where the only way to regain it is to slow things down and shave precious seconds off the clock (you must complete each stage within 60 seconds). Furthermore, don't even think of playing this game while in transit. In a car, hitting a pothole will sometimes spell disaster, and if a plane runs into turbulence, we imagine a eulogy is in order for your soon to be dead primate. On the positive side, Super Monkey Ball features five varied worlds and 110 stages, as well as a practice mode. In addition, it's very well made. Its 3D game boards are colorful, the action rarely slows down (the game chugged for a second) and the familiar and addictive music had us humming along, except when we went on a cursing tirade, of course. It's a shame, because Sega did a good job bringing Super Monkey Ball to iPhone, but the platform kills the game. Whether Sega wants to admit it or not, the best way to play Super Monkey Ball is with a good old-fashioned analog stick. Motion controls, while novel, make the game much too difficult. Sorry, but we don't want to "accidentally" break our $200-$600 phones because one of the game's characters, AIAI, MEEMEE, BABY or GONGON, died for the 30th time. What's Hot: Addictive Monkey Ball shenanigans, looks great, runs super smooth, familiar and catchy music. What's Not: Ridiculous learning curve, extra sensitive controls, near impossible to play while in transit.